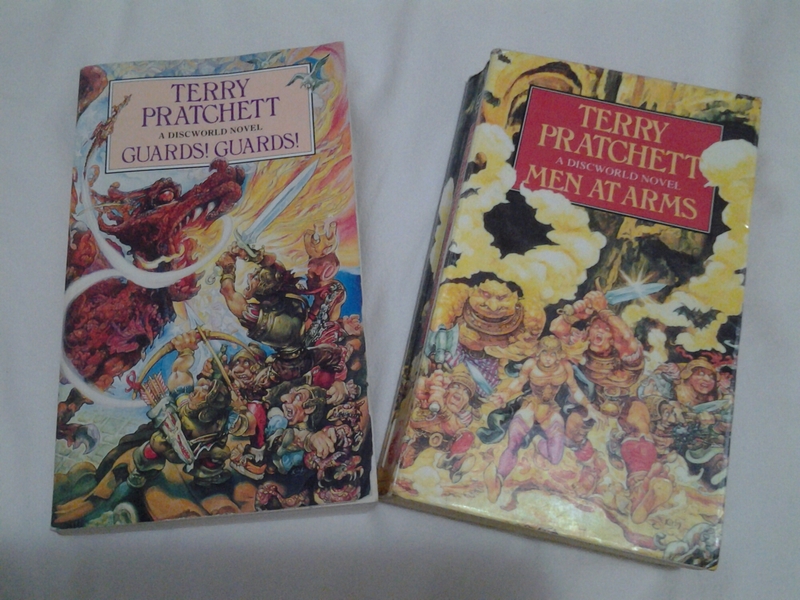 Two of my favourite Discworld novels. Although ‘favourite Discworld novel’ is a bit of an oxymoron, because really, how could one choose? I remember when I first got my hands on a Pratchett book. I was probably about twelve or so. My sisters and I spent a lot of time reading, because when you grow up in the country there’s not a lot else to do (especially on the interminable drives into and out of town). We regularly visited a secondhand bookshop in town, the kind where you could take in a pile of books, the lady behind the counter would do some esoteric maths and give you a credit to pick out some books to take away. I picked up a (slightly preloved) copy of The Colour of Magic for two reasons: one was of course the fabulous Josh Kirby artwork, and the other was the title – anything with the word ‘magic’ in it had my vote in those days. I returned to that cover art many times as I read the book, and not just the first time either – every time I read that scene (or any scene featuring The Luggage, really) I would flip back to scrutinise that incredibly detailed cover. That copy of The Colour of Magic is no longer in my possession, having been lent out and never returned; I did replace it with another secondhand copy though, just so it would feel right. Favourite character? Well, it used to be Granny Weatherwax, until I met Sam Vimes. Which is why the two pictured above are my favourites. I haven’t yet read Raising Steam, but I’ll be dashing out to pick that one up as soon as I can get to a bookshop; I’ve also got The Long Earth waiting on my bedside table, and obviously the other two in that trilogy are on the reading list too. I hope the publishers think to do an extra-large run of The Shepherd’s Crown, because I have a feeling that puppy is going to sell like hotcakes. Sir Terry will be terribly missed. My heart breaks for his family and I wish them every sympathy.